If you are interested in editing videos, you might need a reliable tool that can provide you with various customization tools, while also keeping them at a rather low complexity level. Although there is a wide variety of software that you can rely on to achieve satisfactory results, not many of them come with frame-by-frame editing functions, as SensArea does. Most video editors provide various effects you can apply to a movie, maybe tweaking its brightness, contrast or colors. But typically these filters work with the entire frame only, which seriously limits their usefulness. 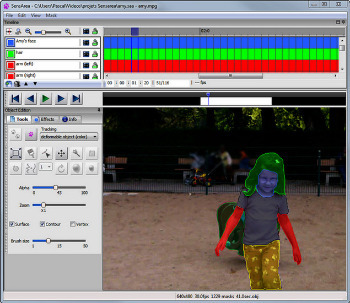 Sensarea is a free video editor for Windows which allows you to select objects, then tracks them in the frame, automatically applying your chosen effects. If you wanted to conceal someone’s identity, say, you could set up the system to pixelate their face with just a few minutes work. The process is straightforward. Open your target video, it’s displayed in a preview window, and you can drag a timeline marker to display any individual frame. If you’re obscuring a face then you’d start by finding the frame where it first appears. There are various selection tools. The simplest is probably the brush: drag this around the edge of the face (or any other object), release the left mouse button, and Sensarea automatically detects and creates a mask around that area. If this isn’t quite right, you’re able to move the mask, erode, dilate or rotate it, or try a different selection method entirely (there’s a “magic wand” option which works in a similar way to regular image editors). The “Effects” tab shows the various effects you can apply to the masked area. “Pixelize” and “Blur” will obscure someone’s face, but you can also adjust colors, make them negative, apply a zoom factor, enhance edges, maybe try to hide them entirely. Once you’ve made your choice, just click Tools > Track and the program plays your video, tracking the selected object, and applying any chosen effects in real time. This won’t necessarily be absolutely correct — if you’re pixelating a face and the shot cuts away then the mask may persist — but this is easily fixed later. Or, in complex situations, you can take more control by having the program track only one frame at a time. Sensarea isn’t the most polished of applications. It’s produced by Grenoble Institute of Technology, and you get the feeling the developers are more interested in playing with smart new image analysis techniques than the tedious stuff like producing Help files, speeding up rendering or improving the interface. Still, the flip side of that is they’re not interested in making money from you either, so there’s no adware or other marketing hassles. And because they know what they’re doing, Sensarea has more than enough video editing power to be useful.